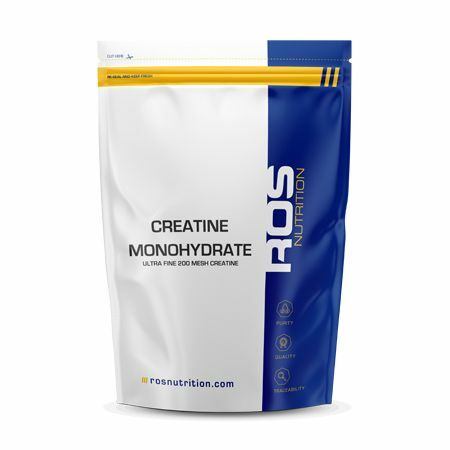 Creatine Monohydrate is a high quality source of creatine that can benefit anyone who is looking for improvements to their training. It can be used by body builders, strength trainers or athletes looking to increase lean mass, strength and maximise power. It has been found to be particularly beneficial for sports which require repeated sprints or exercise which taxes the anaerobic energy system such as power based exercise. Short term creatine supplementation (20 to 25 g per day for 4 to 7 days) can increase total creatine content by between 15 to 30% and phosphocreatine stores by 10 to 40%. The increased availability of creatine and phosphocreatine in the muscle may maintain ATP levels during high-intensity exercise and facilitate ATP (Adenosine triphosphate) recovery post intense exercise. Why choose Creatine Monohydrate ? Creatine can increase the intensity and length of muscular contraction during short term high intensity exercise. By participating in appropriate training and consuming a suitable diet, maximal strength, sprint performance and maximal effort muscle contractions can be improved by the supplementation of creatine; desirable for any athlete striving to increase their competitive advantage. Creatine supplementation has been found to be particularly beneficial for sports which require repeated sprints or exercise which taxes the anaerobic energy system such as power based exercise. During high intensity exercise athletes rapidly deplete phosphocreatine muscle stores and this limits exercise intensity. Creatine supplementation can increase training intensity and training volume allowing athletes to recover quicker between training sets allowing for greater training adaptations. Creatine is naturally derived from foods such as meat and fish; it is also formed in the liver and kidneys from various amino acids such as methionine, arginine and glycine. Creatine can greatly increase rates of recovery due to the support of protein synthesis, the role it takes in rehydration and also the replenishment of phosphocreatine in the muscle cells. Creatine is one of the most extensively researched and widely used supplements available to athletes and has been found to be safe and effective for improving performance. Kreider RB, Ferreira M, Wilson M, Grindstaff P, Plisk S, Reinardy J, Cantler E and Almada AL. Effects of creatine supplementation on body composition, strength, and sprint performance. Med Sci Sports Exerc 30: 73-82, 1998. Spillane M, Schoch R, Cooke M, Harvey T, Greenwood M, Kreider R and Willoughby DS. The effects of creatine ethyl ester supplementation combined with heavy resistance training on body composition, muscle performance, and serum and muscle creatine levels. J Int Soc Sports Nutr 6: 6, 2009.
van Loon LJ, Oosterlaar AM, Hartgens F, Hesselink MK, Snow RJ and Wagenmakers AJ. Effects of creatine loading and prolonged creatine supplementation on body composition, fuel selection, sprint and endurance performance in humans. Clin Sci (Lond) 104: 153-162, 2003. Vandenberghe K, Goris M, Van HP, Van LM, Vangerven L and Hespel P. Long-term creatine intake is beneficial to muscle performance during resistance training. J Appl Physiol 83: 2055-2063, 1997. Take 3 g with 50 ml of water or beverage of your choice. Consume once daily preferably before training. After 8 weeks of continued use, take 1 week off and repeat the cycle.